Businesses in India’s fast growing economy may be judged by more than their employees, but also by the company they keep. Forced and trafficked labour are present in the supply chains of many Indian companies and most don’t know it, say analysts. While experts say the issue isn’t on the radar of most Indian companies, one of the few exceptions is Tata Steel Ltd.
“We see our job essentially as risk mitigation," says Sanjay Singh, vice-president, public affairs, at Tata Steel. “We have to ensure that people that are drawn to the area because of the project are there because they have chosen to be. You can’t go around with one eye shut just because it is a matter of convenience." Worldwide, the largely black-market trade in people generates at least $32 billion (Rs1.25 trillion) a year, according to the International Labour Organization (ILO), which launched a major campaign on the issue in 2005. Some 12.3 million people around the world are forced to work in labour-intensive industries such as construction, agriculture, sweatshops, food processing and preparation, domestic work, as well as the flesh trade, according to ILO. “What we know is that South Asia trails only Southeast Asia in the number of trafficking victims, making it one of the most active places in the world for this and India is a major part of that," says Patrick Belser, ILO’s Geneva-based research coordinator on forced labour, speaking via telephone from a hotel in New Delhi, where he was attending a UN-sponsored conference on trafficking in South Asia. Like most governments, India doesn’t keep the necessary statistics to monitor trafficking accurately at the country level, meaning even the international numbers are broad estimates, says Belser. One in five victims of forced labour is also a victim of trafficking, meaning they have been abducted, coerced or driven into their situation by fraud—usually a promise of a better job that has little resemblance to the one in which they end up. 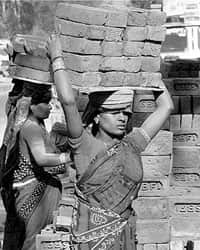 Once there, they often perform back-breaking physical labour with little to no protection from the elements, according to ILO and other UN bodies. While the distinction between forced labour and trafficking can sometimes be blurred and some people can fall into both camps, those who aren’t victims of trafficking are often considered victims of forced labour because although they volunteer for work, they have to take on significant debt they have little to no chance of paying back, trapping them in the situation, say analysts. “Fundamentally, the concerns that drive human trafficking are economic. Poverty, the desperate need for employment and other structural variables are prevalent here " says PriceWaterhouseCoopers partner Anuradha Tuli. More than 300 million of India’s 1.1 billion people live on less than $1 a day, according to the World Bank. A few Indian firms have taken a hard look at their supply chains—Tuli’s firm has worked with “a major tea producer" she declined to name—but most remain unaware or choose to ignore the issue. On Thursday, a “Delhi Declaration" against trafficking was announced at the UN-sponsored conference. The declaration aims to forge alliances to fight trafficking and forced labour in South Asia, including development of a business coalition against the illegal trade in people here. Non-profit organizations working against trafficking hope to see corporate sector involvement on several levels. “The government still doesn’t have a database that can track missing and exploited children and there are many firms that could help them accomplish that," says Shireen Miller, head of policy and advocacy for Save the Children, Bal Raksha, Bharat. “To the extent that they can target their employees and raise awareness so they don’t use child or forced labour in their homes, that would also be a welcome move." As for Tata Steel, it will virtually double its capacity away from its Jamshedpur base in Jharkhand into Chhattisgarh and Orissa. So, it is set to oversee a lot of construction work. The firm asks all contractors to sign and adhere to its code of ethics, which addresses human rights issues, and performs checks to look for things such as evidence of forced labour, said Singh. And the same would apply to any subcontractor hired by a firm working for Tata, he said. The process isn’t necessarily an easy one, he notes: “The steel industry supply chain is very, very long."